This is a happy medium, I get something sweet but it’s an apple, so it’s obviously healthy – right? Ok so it’s an apple filled with brown sugar, sultanas, nuts and the tiniest hint of butter. But it is AH-MAZ-ING. You need to try this. I usually just make two, one for each of us, but the great thing about this recipe is that it would be super easy to scale up. Perfect for autumnal entertaining. Although if I was serving at a dinner party I would be slightly less virtuous and add a scoop of vanilla ice cream. ~ makes enough for 6, can easily be divided. 50 ml whisky, although other alcohols like brandy or sherry would do. 50 grams of unsalted butter, room temp. 2 tablespoons of light brown sugar. 6 eating apples, I used Cox (don’t use Bramley apples as they will disintegrate). Pre heat the oven to 150oC. Find a deep oven-proof dish that will fit all the apples. In a bowl add the sultanas, walnuts and whisky. Leave to macerate for about an hour. After an hour mix the fruit into the butter, sugar and cinnamon. Core the apples, removing the seeds. If they are unsteady in the dish use a sharp knife to flatten the bottom. 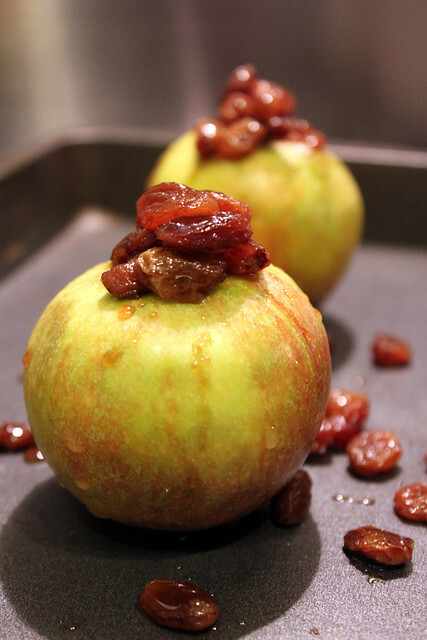 Fill the cored apples with the fruit mixture, cover with foil and place in the oven for 45 minutes. Baste the apples with the juices and put back into the oven for the last 15 minutes cooking time. Serve, although remember these will be boiling hot!